Previously on Survivor, the Davids voted off a Goliath, and then the Davids voted off a David. The David in question had become a Goliath wannabe, though. People were calling Carl the Godfather, and he wound up with a horse head in his bed. 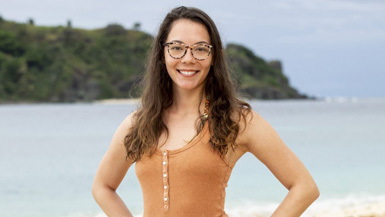 The funniest part of the situation was that Angelina had flipped to the David alliance to get with the winning team, which immediately became the losing team. Angelina’s one particular skill in this game is to make the worst possible move. And she does it over and over again. Back at camp, Gabby is making sure everyone thinks she was the instigator of the vote. Nick does feel blindsided by what happened, and says that they’re “So smart they’re dumb,” which is the title of the episode. He’s pretty ticked off that they used all their advantages to get the numbers, but then they didn’t even tell him about the Carl vote. If he gets the chance, Nick plans to go after Christian. Probst is here already! And he brought family members with him! Not Probsts, but family members of the Survivors! Reward challenge is for LOVE. Needless to say, the Gabby cry count is at one so far. Or two. Basically, she cries for the whole segment. Most of the introductions are what you’d expect, though it reminds most of the players that their competitors are real people with real families. Christian has a girlfriend, by the way! She seems sweet! Gabby’s mighty heart is breaking. Winners will go for a barge barbeque with their family members. There are four pairs of Survivors – Christian/Gabby, Mike/Davie, Alison/Kara, and Angelina/Nick. They are tethered together. They first swim to shore, then dig some keys from a pit. The keys release a bag of balls. Angelina and Nick get their bag first, but they can’t actually get them out of the bag. By the time they do, all four teams are trying to land their balls on top of a platform. Davie lands one first, followed by Nick, and then Angelina. Whoa! Angelina. Shocker. They’re allowed to bring one other person, and they choose Davie. And hey hey! One more! Angelina makes a massive speech about how awesome Mike is and selects him. Did you know she went to Yale? Because she did. Gabby, Kara, Alison, and Christian will go back to Camp Sadness. But first! The reward group talks strategy. All four of them – Angelina, Nick, Mike, and Davie – seem to agree that they’d be a great final four. Of course, we know that Mike says that about everyone. And Davie is feeling a little bit isolated since he knows the other three had some tribal time together after the mix-up earlier in the season. Now that she’s seen Christian with his girlfriend, Gabby is feeling like Christian has to go. She doesn’t want to be perceived as his “sidekick,” so she tells Alison and Kara that Christian is the target. Kara is all for it, and Alison presumably agrees as well. Christian will totally win immunity here in about 10 minutes. In fact, with Probst already appearing, we’re already right into it. Survivors have to balance a pole. If they lose their control, a ball falls and pulls down a bucket, which dumps water on them. Mike is out first, and then when Probst has them shift their foot behind them, Gabby loses it as well. Christian has an itchy head, but stays steady anyway. Alison is totally twitching, Angelina is sweating, and Nick is scratching his nose. The twitching leads to first doom, followed by flop sweat Angelina. Davie, Kara, Christian, and Nick remain. Now, they have to move their front foot behind their back foot, outing more pressure on their arm. Angelina tries to help Nick, telling him where to hold his arm. Christian is fully aware of the Nick support, but he starts shaking like crazy. Even so, Nick loses his bucket. After a couple more minutes, Christian steps off. Okay, so he didn’t win. Davie has a bug on his face, shakes his head to get it off, and drops his bucket. Kara wins immunity. Several of her Goliath counterparts will be happy to see it. So, it’s time to play “It’s Anyone But Christian.” Problem is, Christian knows that, too. He has an Immunity Idol, and he picked up a lot of signals during the challenges. If he doesn’t play it, it will be exceedingly surprising. He goes to Christian and tells him about Gabby’s plan. Obviously, Christian can barely believe it, but after he asks which way Nick is leaning, Davie reveals all. Christian apologizes profusely to Nick, which means Nick is going to LIE. He tells Christian whatever he wants to hear. They’ve got to convince him NOT to play his idol. We tend to think Christian’s instincts are good enough to know whether he needs to play it, but we’re late into the game. People’s mental states get funny. Tribal Council brings on the subject of hurt feelings. Nick has hurt feelings, but says that he and Christian have mended their fences. Gabby is always hurt about something, and says that she needs comforting from people all the time. Angelina just wants to get rid of someone she doesn’t see going to the end with. Nick talks a little more strategically, remembering that if you send someone to the jury, they might have to want to vote for you. When Jeff asks if anyone wants to play their hidden Immunity Idol, Christian asks for a moment. He looks everyone in the face, and then says yes. He’s playing it. Genius. Jeff reads the votes, proving Christian to be ABSOLUTELY right. The first five are for Christian. They don’t count. “How’d you get that big brain?” Gabby asks. Next, one vote for Alison. “I’m so sorry, Alison,” says Gabby. She should be. Final two votes are Gabby. Mike White! You evil genius! That was the most brilliant suggestion and it made PERFECT sense. The jury is delighted. “Sorry, Christian! I love you!” she shouts as she leaves.